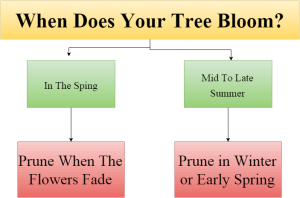 When Is The Best Time To Trim Trees Or Bushes? When’s the best time to trim trees? This is a question our Arborists receive a lot. The truth is, there isn’t one correct answer. The best time to trim trees depends on the species and what you would like to achieve. But for a simple answer, the dormant season between late fall and early spring is the best time to trim. Why Is Winter The Best Time To Trim Trees? In winter branch defects and structural issues are plainly visible with the absence of leaves. Don’t worry, Arborists can tell the difference between a live branch and a dead one even if there are no leaves. In the cold months, there is less risk of disease or pest infestation. 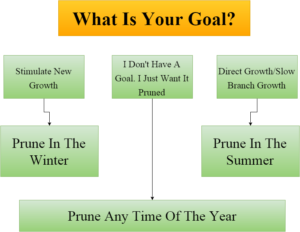 If your goal for tree pruning is to direct the growth by slowing the branches you don’t want; or to slow the development of a tree or branch, the best time to trim is summer, soon after the seasonal growth is complete. Unless there are mitigating factors, RTEC is able to trim most trees year round. If you would like your trees pruned during the best time to trim trees for your species and goals don’t wait; talk to one of our Arborists now. 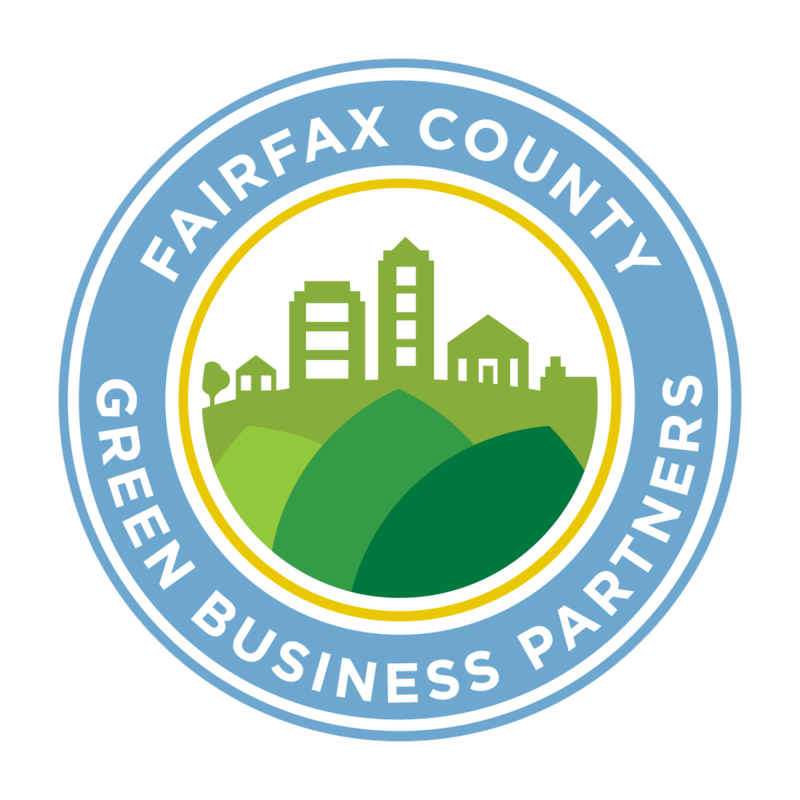 They will be able to recommend the best time to trim the tree, get you signed up, and schedule the tree work to be done at the optimal time. With proper technique and skill most species can be trimmed year-round; however, it’s key for the health of certain species to be pruned at a specific time of year. Always Keep In Mind: Dead, damaged and diseased limbs that pose a health risk to the tree or a safety risk to people and property should always be removed as soon as possible. Crepe Myrtles should be pruned after the last frost of the year in order to produce a vibrant bloom. The optimal pruning period for oak trees is during the dormant season, late fall/winter. This is recommended because oak wilt and other diseases are active in spring and summer and can infect a tree with open wounds. However; when tree companies abide by ANSI Pruning Standard and perform proper cuts with clean equipment, contracting a disease during or shortly after tree trimming should not be an issue for a healthy tree. It is best to trim elm trees in the dead of winter because of Dutch Elm Disease. During winter this disease is not active; this makes it safer for the Elm tree to be pruned. However, with any tree that is susceptible to disease or insects proper pruning with sanitized equipment should be enough to keep Elms from contracting Dutch elm disease. When Maple trees are pruned during the winter sap flows from the pruning cuts; generally, this will not hurt a mature tree. To avoid this issue altogether wait until summer to trim maple trees. Once the leaf buds open, the sap will no longer leak out from the pruning cuts. Like trees, trimming bushes depends on the type of species. However; when in doubt always prune in the dormant season (winter). For bushes without blooms (like burning bush, boxwoods, and barberry) prune these anytime except for late autumn. Bushes trimmed in late fall may not have enough time to harden off the pruning cuts before the first frost. This could cause damage to the bush. For early spring blooming bushes (like lilac, forsythia, and rhododendron) prune in late spring immediately after they finish blooming. If you wait to prune these types of bushes during summer or winter you will see lower amounts of spring bloom. For bushes that bloom during the summer (like butterfly bushes and hydrangeas) prune these bushes in winter while they are dormant or in early spring before new growth develops. Now that you know the best time to trim trees book a consultation with one of our Certified Arborist.